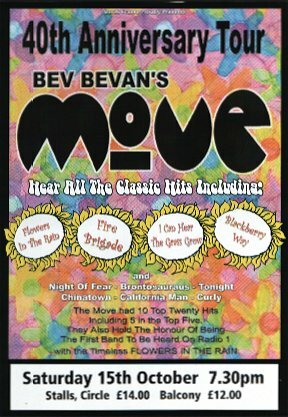 Here is my review of the excellent concert performed by 'Bev Bevan's Move' at the Pavilion Theatre in Glasgow on Saturday, October 15th 2005. According to Bev during one of his chats with the audience, this was the 15th gig the band had performed up to now on this U.K. tour. It must also have been one of the smallest audiences the band have ever performed to also!! I estimate there were only 100 to 150 in this 1500 seater auditorium - a shockingly low turnout. We had arrived at the venue quite early and once again like at a previous concert we attended back in 2003, we took the chance to look around this beautiful Victorian era theatre which has been restored in recent years into an excellent venue for live music. Check out the website at www.paviliontheatre.co.uk for the webcam views of the theatre. From the moment of hearing about this tour, I was eagerly awaiting listening to Move songs performed live on stage. Being an avid Move / E.L.O. fan I knew the pedigree of the artists involved with the band and I was particularly interested in seeing Neil Lockwood, as it is nearly 13 years since I last saw him live on stage with Electric Light Orchestra Part 2 in Newcastle - in the days of the 'big hair'!! The band took to the stage just after 7:30pm to noisy cheering and applause from the sparse crowd, and began the gig with a cover of the Byrds' song 'So You Wanna Be A Rock & Roll Star'. The Move did do a live cover of this song which is on the 'Something Else' e.p. Some great harmonies by the band on this track. Next up, the reason we were there for, a couple of classic Move songs, 'Fire Brigade' and 'I Can Hear The Grass Grow'. 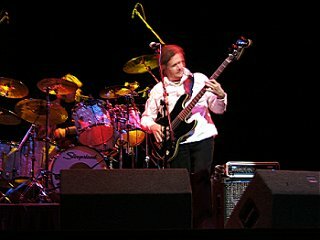 Again the harmonies of Phil Bates, Phil Tree & Neil Lockwood were very reminiscent of the Move in their prime. Neil in particular sounding remarkably like Roy Wood! The audience responding with great applause after each track with a few up and dancing already!! 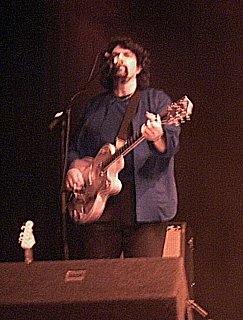 Bev came down to the front of the stage again to great applause and he gave a quick chat about how the current band came about and also about how the late Carl Wayne 'should' also have been there on stage with them - but he would definitely be looking down on us all with a big smile on his face. A nice round of applause from the audience at this point. Bev then chatted about some of the bands the Move toured with and introduced the next cover version, 'Strange Brew' by Cream. This really showed off the fantastic guitar playing of Phil Bates, and also the great vocals of Phil Tree. Two more covers followed, 'Lucille' by Little Richard and 'You Never Can Tell' by Chuck Berry. Bev then stepped down to centre stage to introduce another two Move songs, 'Chinatown' and 'Curly' which Bev jokingly said was about Carl Wayne's pet pig!! Again great applause greeted these two songs. 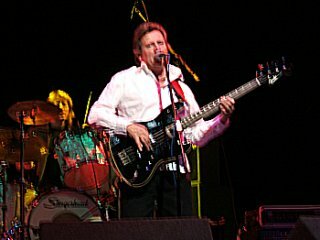 Once again Bev came down to front stage and chatted about his early days with Denny Laine & The Diplomats and how when Denny left to join the Moody Blues, he saw the Moodies on Top Of The Pops surrounded by lovely young girls and here he was sat at home, out of a job! This got the audience laughing and also a bit of sympathy for Bev too. The band then performed an excellent version of 'Go Now', 'Gimme Some Loving' by the Spencer Davis Group and then an amazing guitar solo by Phil Bates during a cover of Jimi Hendrix's 'Purple Haze'. Another couple of Move songs ended the first half of the show, 'Night Of Fear' (introduced as the Move's first hit single), followed by Brontosaurus (probably the Move's heaviest song as introduced by Bev). We then had a 25 minute break for the audience to have a chat about the show so far and have a drink or two in the bar!! The band came back onto stage to quiet applause for the second half of the gig and performed a very nice version of 'Drift Away', followed by a cover of the classic Chuck Berry song 'Route 66'. A nice acoustic version of Jeff Lynne-era Move track 'Tonight' followed which the audience reacted very well to with Bev down at stage front playing the tambourine. Next up another cover song 'Aint No Sunshine' by Bill Withers. Bev then came up to the front to introduce the band members and then the next few songs. 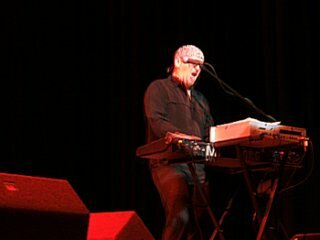 The audience were now singing & clapping along and the next two tracks again highlighted the superb guitar work of Phil Bates plus the amazing keyboard skills of Neil Lockwood - two Fleetwood Mac songs, 'Black Magic Woman' and 'Need Your Love So Bad'. 'Back In The USSR' follows next which has the audience singing and clapping along before two more Move songs round off the concert, 'Flowers In The Rain' & 'California Man'. Bev had talked about the legal situation regarding 'Flowers' and also about it being the first song to be played on Radio 1. Great cheering and applause as the band left the stage, but we knew there was at least one more song to follow!! Yep thankfully there was to be an encore with the best saved for last. 'Blackberry Way' had everybody standing up, clapping & singing along. Absolutely brilliant, but even this was out-done with a surprise finale. Even though it was a cover version, what a song to do - 'Roll Over Beethoven' including orchestral intro via Neil's keyboards - stunning!! The concert ended with Bev bouncing down to the front of the stage and throwing his drum sticks to some youngsters down at the front row and the band leaving to great applause. My apologies for only having a few photos here, but a couple of low points of the concert were the usual Pavilion Theatre 'gestapo' preventing fans taking a couple of memento photo's and even more bizarrely, stopping some fans from dancing in front of the stage - absolutely stunning considering the small audience. Even the band were shaking their heads at this!! But overall, a thoroughly enjoyable gig and we really would recommend fans getting to see these guys if at all possible. Great musicianship and a great tribute to a great band.